A group of innovators/entrepreneurs found their own way to help residents of Tacloban City get back on their feet after the devastation of typhoon Yolanda in 2013. More than a year after Typhoon Yolanda, things are looking up in Tacloban City, thanks to businesses bringing hope—and much-needed livelihood—to people left adrift. One such enterprise, TACLOB, employs adult Yolanda survivors to create schoolbags for child survivors. “The message from survivors was very clear: ‘We appreciate the relief support, but what we really need are sustainable jobs to help us rebuild our lives.’ Our model is simple: get awesome products made by survivors, and donate awesome items to those who need them most,” says Justin Capen, the California native who spearheaded the project. 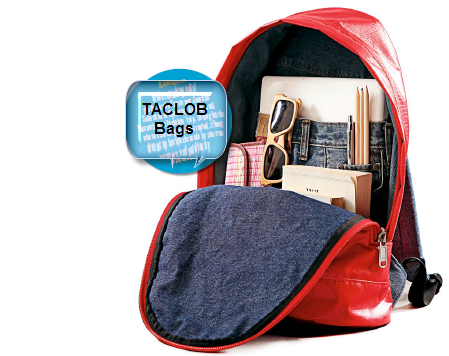 In August last year, TACLOB—which means ‘to cover’ in Visayan—began rolling out Compassion, a bright red, weatherproof backpack made from upcycled tarpaulins, denim, and leather; and Courage, a weatherproof schoolbag, containing school and art supplies, that also doubles as a flotation device that can carry up to 135 lbs. Both bags are exclusively designed for TACLOB by homegrown bag maker Khumbmela. So far, response has been ‘incredible,’ Capen says, thanks in part to celebrity endorsements and online buzz. TACLOB has bagged orders from nearly 20 countries through its website, taclob.com. Orders are paid via Paypal and direct deposit, and soon, via DragonPay and Bitcoin. The first batch of bags were delivered in time for the recent Christmas. Each purchase of $100 (P4,300) covers the donation, and workers’ wages, too. “They survived the strongest typhoon in the recorded history of earth. They shouldn’t be subject to waiting for handouts for the rest of their lives. They are entitled to the dignity of being able to sustain themselves,” says Capen. This article was originally published in the September 2014 issue of Entrepreneur magazine (with updates from the editor). Subscribe to the print or digital version here.